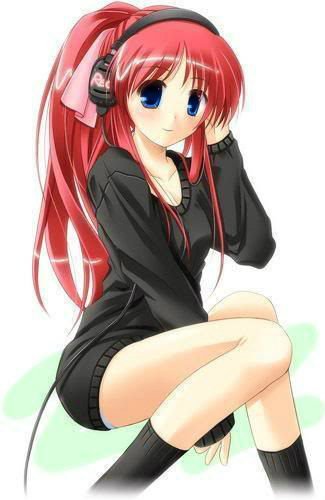 ऐनीमे Girl W/ Headphones. . Wallpaper and background images in the एनीमे के लड़कियाँ club tagged: anime girl headphones red hair music cartoon. This एनीमे के लड़कियाँ photo contains चड्डी, leotards, hip boot, and thigh boot. There might also be होजरी, नली, नंगे पैर, pantyhose, चिपटनेवाला पैंट, चिपटनेवाला, पेंटीहॉस, स्किन्टाइट पैंट, स्किन्टाइट, skintight पैंट, skintight, जुराब, and मोजा.